adjective hardhearted: showing no concern that other people are or might be hurt or upset [14th century. Directly or via French < Latin callosus "hardened by friction" < callus "hard skin"] -cal·lous·ly, adverb -cal·lous·ness, noun callous or callus? 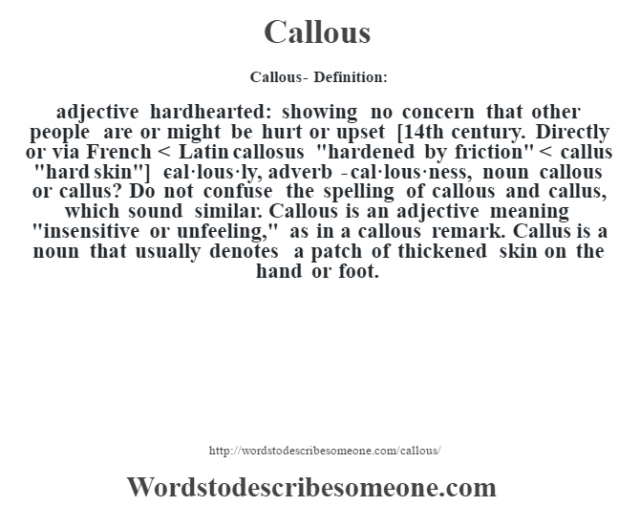 Do not confuse the spelling of callous and callus, which sound similar. Callous is an adjective meaning "insensitive or unfeeling," as in a callous remark. Callus is a noun that usually denotes a patch of thickened skin on the hand or foot.